Legendry greats of cricket Geoff Miller and Tony Cottey joined Leicester-based snooker legend Willie Thorne at Loughborough Grammar School to raise money for Loughborough-based charity, Rainbows Children’s Hospice and the school’s cricket team for their tour of the West Indies later this year. Champions (UK) PLC of Costock are proud to be organising the event and hope to build on last years total of over £60,000 raised for Rainbows. As well as legendry cricketing tales from Geoff Miller and Tony Cottey the night also included a stunning auction with fantastic memorabilia featuring; a signed image of the England 1966 World Cup heroes, a personally signed image of Hollywood film legend Steve McQueen, and a personally signed image of English cricketing great, Sir Jack Hobbs. 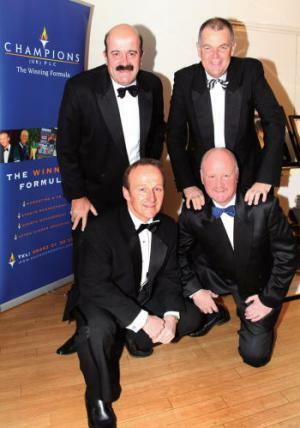 Mr Maximum himself, Willie Thorne who is patron of Rainbows will be hosting the evening hoping to support the school cricket team’s bid to visit the West Indies for 13 days in March, playing four matches in St Lucia and two in Barbados. Porsche of Leicester have kindly donated the kit for the Team’s tour and are proud supporters of the event alongside; Mattioli Woods, Tenon, Shepshed Building Society, Moss Solicitors, Moir Wade, Aiden J Reed, RWP Chartered Accountants and Just Burgundy wines.